grinds and polishes achromatic lenses, high class lenses used, e.g. , for microscope objectives; fixes lens in lathe chuck and shapes by hand cutting with diamond and / or by bringing it into contact with revolving (abrasive ) wheel; grinds and polishes, combining work of rougher, smoother, edger and hand finisher (q.v.). takes bottles out of cool end of lehr (annealing kiln); sorts perfect from imperfect bottles; usually also stacks bottles, balsamer, lens balsamer, see cementer (lens). bends flat glass by heating it in small kiln, a buff or muff, and, when he decides that it is sufficiently heated, placing glass on a mould so that glass falls to shape round mould : places mould and glass in lehr for annealing; (watch glasses) cuts thin sheet glass to shape, heats over gas jet and bends to shape on mould. polishes glass by hand, with felt covered pad or block, to remove slight defects, e.g. , scratches; cf. sider. brushes hot pitch over concave or convex metal holder, embedding evenly therein, by hand, roughed lenses, and pressing mounted lenses downwards into a reciprocal convex or concave mould to present a true surface for smoother (q.v. ); dips holder in cold water to harden pitch; receives holders after smoothing, breaks-off pitch and remounts lenses, on their reverse side; heats pitch and holder over gas flame or hot plate, and cleans holders with cloth to remove pitch. planes glass received from glass painter (q.v.) in kiln to fix, i.e., burn-on, colours; stokes fire, maintaining temperature necessary for fixing. pours molten glass into special frames or plate glass moulds in front of metal rollers on table, see roller; conveys empty crucible back to furnace. (ii) high grade work, warms balsam on gas heater plate and pours-off only clear liquid for use; drops spot of balsam between two lenses, presses lenses together, wipes-off surplus balsam and ensures that balsam covers whole surface between lenses, that no air bubbles remain, and that balsam does not become opaque; sometimes places to harden in an oven, regulating temperature to ensure against glass cracking. embeds prism in cement, a preparation of pitch, for use of flat worker (optical glass) (q.v. ); processes as for blocker-out. mixes cement and puts it between lead and glass of stained glass windows, using hand tool; wipes-off superfluous cement. places lens in a cement bed in chuck, secures chuck in lathe spindle and switches-on power to drive spindle; watches, in revolving lens, light reflected from a mirror and moves lens in cement lied until image stationary, denoting optical centre found; allows lens to set in this position and sometimes edges, cf. edger (optical lens). places rough-cut lens in centring apparatus and looks through lens at a disc marked with vertical and horizontal diameters; moves lens in holder until in right position, then moves lever causing apparatus to mark lens with three dots, at centre and two other points, as a guide in cutting lens; adjusts micro adjustor with screw to set distance of outer dots from centre dot. see stained glass window worker. trims chemical ware with flame and diamond; adjusts height of diamond above bed plate of apparatus, by a screw; turns bed plate so that article to be trimmed, e.g., flask neck, is scratched by diamond; places flask, etc., on a turn-table and, regulating heat of flame, plays upon scratch with gas jet; completes severing by touching crack with moistened finger. measures and marks sheet or plate glass to best advantage, and cuts with glazier's diamond for windows, show cases, or for silvering, embossing, etc., by hand, using straight edge, T-square and/or boring tool for marking out; cuts incidental curves free hand; in small shops often also "sides," cf. aider; sometimes specifically designated, e.g., sheet glass cutter, plate glass cutter, window glass cutter; cf. flint glass cutter (126). adjusts cutting machine to cut lens to desired shape and depth, by engaging cutting diamond on a "former," which controls its path, and by turning screw micro-adjustor at side of machine; places lens marked by centerer (q.v.) exactly in position on rubber pad, and brings diamond down upon lens; removes cut lens from machine and shears-off superfluous glass by nipping it with a shanking tool along deeply cut line marked by diamond. in glass sign writing trade, cuts and sometimes also, in small shops especially, bevels, polishes and gilds glass letters; selects glass and marks either free band or with stencil; cuts letters on revolving stone, treadle or power-driven and automatically or hand fed with abrasive; bevels and polishes, cf. beveller (127), polisher; some times also mounts gold leaf, first applying size. passes finished photographic plates into plate cutting machine; adjusts, by gauge, position of plate cutting diamond; inserts large sheet of glass; switches on and off power drive; removes from machine cut plates. smears or sets edges of small circular saw with paste containing diamond powder. pushes table containing glass under grinder runners or discs; starts machine and keeps discs or runners fed with abrasive pastes. keeps discs, used in flint glass cutting mill, fed with abrasive paste. heats foundation, received from coverer (124) (q.v. ), in glory hole, i.e., fiercely heated furnace, to correct temperature for drawing, and enlarges air space in foundation by blowing into blowing iron; restores foundation to cylindrical shape by working it on a marvering table; attaches one end of foundation to post held by post boy (139) (q.v.) and walks backwards to draw foundation into a tube between post and blowing iron; rolls tube, simultaneously with post boy, and (dews down blowing iron to assist even attenuation; judges, by eye, size of completed tube or directs calipering; lays tube, when sufficiently cool, in trough or on floor for cutting; cf. lehr drawer (139). general term covering lamp blower, chemical glass blower (124), or, drawer (138), parison maker (124), etc. centres lens, cf. centerer (optical lens), applies abrasive to edge of set lens, switches on power and brings a brass plate into contact with edge of revolving lens, regulating position of plate by means of screw; continues edging until lens will just pass through a test ring; taps chuck with hand tool to loosen lens from cement. (ii) in case of rimless spectacle lenses, places number of lenses in attachments, which hold them in position; grinds as in (i), adjusting attachments so that lenses rotate at desired angle in contact with revolving sandstone wheel. paints glass articles with ground enamels mixed with oils; and heats them in a furnace until colours are fused into glass; sometimes specifically designated, e.g., lamp lustre enameller. a glass worker (drawn) (q.v.) who assists in drawing glass rods or tubes by fanning, as it is drawn, part which is to be cooled roughly gauging it at same time with tool in other hand. passes lengths of glass tube into an automatic machine; adjusts gas jets which soften glass and watches automatic formers for faulty work; removes finished flanges with tweezers to; tray. places beaker, flask, etc. ; received from cracker-off (q.v.). in clip in a type of lathe, and forms mouth of flask, etc., by inserting tool in neck of flask, edge of which is revolving under a gas flame; places flask, etc., in another device to form lip; regulates size of gas flame. smoothener, straightener and flattener; levels out sheet glass with flat block of charred wood, called a polisher, while still hot in flattening kiln. (iii) commonest class work, cements prisms in ring, as above, and secures ring in grinding machine; applies abrasive, with brush, to grindstone as ring revolves thereon; regulates grinding machine by hand lever. cuts off glass as it leaves tubes of glass blowing machine, in drawn-glass department of sheet glass works, by chilling with a curved hook-shaped rod of iron. 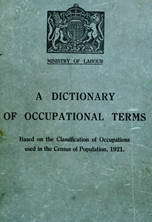 general term for operative engaged in any process in connection with glass decorating, e.g., cutter, enameller, gilder, etcher (126) (q.v.). general term for any person working in glass house; hand-made glass, includes "chair" workers, i.e., gatherer (123), blower, servitor, maker, chairman, finisher, worker, etc. (124), batch mixer (138), stoker (122) (q.v. ); other branches, includes batch mixer (138), blower (124), gatherer (123), moulder (126), stoker (122) (q.v. ); all branches, is sometimes applied only to glass house labourer (139) (q.v.). mixes colours and paints design upon glass, copying from original design prepared by artist. general term for operative engaged in any process in manufacture of glass; or in shaping or preparing it for various uses. general term for man engaged in any process in connection with flint -table glass, e.g., foot blower, servitor, maker (124), polisher (flint glass) (q.v.). general term for man engaged in any process in optical glass making, e.g., cutter (optical glass), lens grinder, achromatic hand, edger (optical glass), prism cementer, flat worker (optical glass). general term for operative engaged in any process in connection with production of plate glass; e.g. , founder (122), moulder (125) (q.v.). glazes inside of new pot, or crucible by taking molten glass from another pot and plastering inside therewith all round, to close pores of clay. bats, i.e. , shears, spectacle lens to shape for edger (q.v.). (iv) (watch glasses) receives glass from bender (q.v. ); soaks sponge in oil and so secures glass in contact with carborundum wheel; grinds and bevels glass on wheel. (ii) high quality work , a rougher or smoother (optical lens) (q.v.). puts lens received from rougher (q.v.) in a cap or holder and brings in contact with a revolving mould, deeper than those used by rougher; keeps cap in contact with mould by slipping a rod in position in top of cap; removes lens when ground to correct curvatures feeds mould with emery paste. see flat worker (optical glass). a grinder (q.v.) who grinds stoppers and glass balls on a special lathe. receives lens from smoother, or, if edged, from edger (q.v. ); fits mould of desired curvature on switch operated spindle and, using fine abrasives, works surfaces of lense [sic] up and down against revolving mould; frequently applies Newton test, i.e. , holds upper surface of lens against surface of -another lens of desired curvature ,and notes colour rays thrown-up; when lens is optically correct, inserts felt in mould and polishes, using rouge. see burner ; cf. kiln dresser. receives painted designs; coats a sheet of glass with wax, picks-out suitable pieces of glass from a box, and presses into position in wax to build-up design for stained glass painter (q.v.). packs articles in lehr or annealing oven, exercising care in placing different sized articles so that none crack through excessive heat; regulates firing to control heat, usually himself shovelling fuel on fires; directs assistants (139) (q.v.) if any; in hand made glass trade is a shrowerman (q.v. ); small glass works places pans of hot glassware in hot end of lehr and collects as they emerge at cold end; rejects faulty .glass. as for glass worker, optical. makes objective lenses for high power microscopes, working at small side lathe; sometimes makes right through from piece of plate glass; otherwise first receives discs om rougher (q.v. ); either case, does work of smoother (lens), polisher (optical lens); is sometimes an achromatic hand (q.v.). general term for all workers making photographic lenses, e.g. , rougher, grinder, polisher, hand-finisher, edger, cementer, setter (q.v. ), except flat worker. general term for a worker engaged in any of the skilled or semiskilled operations in lens manufacture, including cementer, finisher, grinder, polisher; sometimes specifically designated, e.g. , micro-objective lens worker, achromatic lens worker. (ii) examines plate glass after polishing. (ii) sorts stock glass into grades according to size, colour, and quality. weighs out and mixes, in wooden trough with shovel, under direction of manager or foreman, specified proportions of raw materials which go to make metal; cf. mixer (139). builds-up mosaic in enamelled glass from coloured design, exactly matching colour gradations; chips glass to shape with hammer and chisels and glues face downwards on brown paper support ready for mounting; sometimes also works in stone; cf. mosaicist (stone) (571). mounts lustres on chandeliers, etc., after they have been drilled, threading wire through holes therein, cementing wire into position if necessary, and, with tweezers, bending wire to form rings, hooks, etc. ; often also drills as for perforator. as for lens maker (micro objective hand work). grinds, adjusts or otherwise prepares lenses in workrooms; sometimes spends part time in serving customers behind, counter. (ii) smaller articles , drills with a bow drill or any other type of hand drill mounted on a., bench or stand; moves an attachment connected with drill up and down or backwards and forwards; or operates a sensitive drill press, switching on power, and regulating pressure of drill upon glass by pressing on an attachment to drill. softens mouth of glass article in furnace and opens out with wooden jacks or spring tools with charred wood prongs; tests dimensions with calipers. polishes flint glass articles, by holding them against revolving wheels or brushes, and moving them about as required; in bold work polishes on wood or cork wheels fed with pumice powder; then with rotten stone, and finally with putty powder; in fine work on circular fibre brushes 6 to 7 inches in diameter, fed with mixture of putty powder and water. receives lenses on smoothing holders and polishes as for smoother (lens) (q.v. ), using rouge instead of emery paste, and using felt lined moulds. polishes plate glass by hand on polishing tables, using rouge, or pumice, and polishing cloths, pressing evenly on glass to polish uniformly. places spectacle lens, from lens grinder (spectacle lens) or from smoother (lenses) (q.v. ), in a cup or holder and fixes this in contact with mould; moves lever to engage cloth or felt covered mould with pulley and shafting so that lens is polished by rubbing against mould; applies rouge with brush or by hand to mould; changes moulds as necessary. does best class work in making spectacle lenses, in manufacturing optician's establishment, according to customer's prescriptions; has usually served apprenticeship and has been through various workshops, roughing, grinding, centring, cementing, etc. a cutter (q.v.) who uses a "range" or gauge to determine thickness of glass, price of which depends on weight in proportion to area. controls levers of power driven rollers used by presser (125) (q.v.) in making plate glass. (ii) for curved work , taps slabs where partially cut by slitter, to break into portions; marks lens outline thereon and snaps-off superfluous glass; grinds such blanks to standard curvature, testing against gauge, and using series of moulds of gradually deeper curvature, fitting moulds to spindles; smears abrasive on moulds during grinding. fastens and adjusts iron plates on runners, or revolving grinding arms, in plate grinding. receives lenses from cementer (lens) (q.v.) before balsam quite set and finds common optical centre as for edger (optical lens); watches reflected image of light from mirror and moves slightly one of component lenses until they are concentric; allows cement to harden. takes hand made glass out of lehr (annealing kiln) at cool end, and sorts into sizes. examines glass for defects and selects more polished side for silvering, in making of mirrors; marks, with whiting, etc., for silverer (q.v. ); and polishes out scratches and stains with cloths, etc., and rouge, or, revolving bob; sometimes done by cutter (q.v.). lays sheet of glass to be silvered, face downwards on table, sometimes heated, covered with felt, and pours on back of it solution or nitrate of silver, ammonia, and salts, causing a deposit to he formed thereon; then pours off surplus solution, varnishes and paints it with special paint, to protect silver. places holders, received from blocker-out (q.v. ), each on smoothing machine spindle: inserts in machine smoothing moulds of right size and curvature; applies emery paste and moves lever causing moulds to rotate about lenses on holders; applies emery as necessary and stops process when he considers smoothing complete. a youth engaged in processes of smoothing and polishing, by hand, small cheap lenses; cf. smoother (lens), polisher (lens). examines finished or partly finished articles in warehouse to detect defects, etc., and grades them for size, quality and class. a glass cutter (q.v.) who measures and cuts discs of crown glass into convenient sections or squares with glazier's diamond, reducing waste to minimum. general term for worker engaged, in any capacity, in production of stained glass windows, including draughtsman (932), glass painter, stainer. traces outline of drawing, in stained glass window manufacture, with a brown pigment containing finely powdered glass, and covers surface of glass with a wash of this pigment. does some or all of following operations: puts glass stopper in lathe; cuts strip tin to shape and hammers it out into a thin band; sprinkles band with moistened emery powder and bends it round revolving stopper; continues grinding until, by trial, stopper almost fits neck of bottle; cuts and hammers tin to shape and hammers it on to a peg to form a plunger; using emery on plunger, grinds bottle neck until, by trial, stopper fits perfectly. pours molten glass on to casting table. trims or shears any excess of glass at ends of cast plate after rolling; prepares table for plate glass polishing by spreading bed of plaster of Paris to receive annealed plate. general term covering bender (watch glasses) and grinder (watch glasses) (q.v. ).